Last time I was at Crosby Hop Farm (see here), it was raining hops. The Woodburn, Ore.-based family hop farm (about 32 miles outside of Portland) invited CBB out to its hop harvest party last year. We toured mass unharvested acres, inspected high-tech processing facilities, drank liters of craft beer and watched Blake Crosby (CEO and president of Crosby Hop Farm) play drums in a surprisingly talented retro instrumental rock trio called The Choppers. Around the stage and beer tents, hop vegetation actually floated through the air. Wind was blowing it in from the processing facility. It was sort of a special moment — a perfect September night, cued up to a Ventures– and Bill Doggett-style ‘60s rock jam soundtrack, where brewers, growers and craft beer all intermingled under a light hop downpour. Hops blowing in the wind. So naturally, I was excited to catch up with Blake again at the Craft Brewers Conference and BrewExpo America earlier this month to: A) see what was cool and new at Crosby Hop Farm, one of the most progressive hop farms in America; B) capture insights on the constantly evolving hop market for craft beer overall; and C) get re-invited out to the Crosby Hop Farm party this fall harvest. I feel I accomplished all these tasks. Just check out the Q&A below. CBB: Blake. Thanks a ton for taking the time to talk to us. I know your Craft Brewers Conference is busy, so we appreciate the opportunity to talk to you early on [10 a.m. the first morning] — while you’re still fresh. So first off: What’s cool and new at Crosby? I know you guys and gals are growing Comet now. This is a first, right? Blake: Yeah. So, Comet’s been fun and exciting. It’s one of the old-school hops that’s come back in a somewhat significant way over the last couple years. We’ve been sourcing it out of Yakima, which we’ll continue to do. I should note one of the things that’s cool about us is that we buy from other people and from other regions. Of course, we grow our own in Oregon. But you’re also a supply house. Yeah. But now we’re offering Oregon-grown Comet, which is the first ever, so that’s what’s kind of fun and exciting. I’ve found with other kind of varieties, like Amarillo, in our area, much like other areas, they have their unique characteristics, and many breweries have really been digging the stuff that we’ve been growing out here. Describe some of these unique characteristics. Well, we’ll find out about Comet next year. Next year will be the first year we’ll have Crosby-grown Comet. The harvest in 2018. We’ve found with other varieties, generally speaking, we tend to have a little more, definitely floral characteristics on some of the hops. Even the more aggressive, assertive hops can have more floral characteristics and often more stone fruit, tropical fruit characteristics out of our a-bit-more-moderate climate. So yeah, it’s interesting. It’s actually played well with some of the flavor profiles that are in vogue right now. Proof that this actual interview happened at the Craft Brewers Conference. And you’re expanding your Amarillo crop as well? Yeah. That’s a good segue, so with Amarillo we’re expanding by about 50 percent. Amarillo as a brand has been quite popular around the world but grown around the Northwest — specifically the stuff we’ve been doing in Oregon — has been very popular. It’s been exciting because we’ve learned that there’s a niche there for Oregon Amarillo, and folks wanting it produced right on site. It’s been challenging in a sense to be able to expand as quick as we’d like to. There is a one-year lag. And also ground, real estate. Are you guys expanding acreage or are you just steadily giving more of your space to Amarillo? We’ve actually, in this case, been able to expand acreage overall, so that’s cool too. We’re getting close to fully using most of our harvest capacity. We’ve been pretty careful about selecting varieties we’ve put into certain harvest windows. It can be overload. Blake’s got a byline on the site. A Hop Farmer’s Diary: 30 days in the life of Oregon’s Crosby Hop Farm. Is there anything that people are kind of gravitating away from as far as varieties? I’d say, and you know I hate to say this, it pains me a little bit, but Cascade. I think there are nuances there, and I was talking about this with a brewery yesterday. We’re really excited about the new stuff — whether it’s the Azaccas, Amarillo, the Cashmere — that the public is out there craving right now. We’ve also seen so much opportunity in terms of Chinooks but not Cascade. We’ve seen so much variability, and find that a lot of breweries might not be optimistic of what Cascade can really optimally do for them. Mmm … fist fulls of toasty hops straight from the kiln at Crosby. So we’re playing around with different kinds of aroma protocols on our farm and in our growing varieties. We’ve gained some very, very positive results. Last year we had one of the biggest breweries in the country actually say, you know, that Chinook lot that we’d grown and sent to them, it was like the best hop they’d rubbed all year. But whether its Chinook, Amarillo or whatever, demand is always changing. The hazy IPAs. The big fruit bombs. Whatever. We all love them, but you also need to be able to do the classic styles as well — to have max market appeal. I think this is at a bit of a higher level so to speak. In the sense that we might see those old varieties come back? We have a bit of a theory internally, with all the noise in the market and things have been moving so quickly, what possibly could even be next? You know? We might be in this part of the cycle where we start moving back around to, I don’t know if it’s just another Cascade, but a revisiting of some of this kind of older-school stuff. If we could put stuff out that was truly unique and different, in the way we grow it, maybe it’ll still have to be called Nugget or Chinook, but it would be different in a local way. Just a clever way to sort of rebrand the idea of a classic hop. We’re doing the classic, but the profile is different. So we have a gentleman, Zak Schroerlucke, he’s our marketing guy, and he’s real big into music. He’s like, “Yeah, I kind of see it like vinyl. How vinyl is coming back in the music world.” We all see it. Styles reemerge, and we will see that again — where certain hops end up kind of getting revived. I saw a video on your pellet operation recently. Very nicely done. You guys have had the pellet mill since 2012 maybe? And 80 percent of what you guys and gals are doing is pellets. I remember the video said how your pellets are softer, so maybe you could tell me why that’s important or tell me how your pellets are different from everybody else. That’s been something that’s been doing really well in the market for the last few years. It’s a more dry-hop-driven, craft-specific pellet. When we came to the market, we brought that initially back in 2012, we were about 15 percent softer than your status quo pellet you can find out there. The results in terms of flavor and aroma have actually been better, as well as just performance — specifically in the cellar and fermentation dry hop applications — where we find the hops will break apart a lot easier. Not only is that damaging to the hops, but then you’re paying all this money for these hops and they end up at the bottom of the conical. I hear stories about it all the time where it’s just a big pile of pellets that never really had a chance to hardly dissolve, depending on how dense they are. So, that’s continued to play really well in the market. There’s more education around that. I think there’s also some more processors starting to go that direction as well. It’s kind of exciting. We were one of the early adopters of that. Brewers are really preferring it over the more classic pellets I guess. What about hop hash? I remember the last time I talked to you, you said you could barely make enough hop hash for SweetWater Brewing Co. in Atlanta. Are you guys making more? Is it available to other people? Ingredient Insight: Learn how hop hash is at the heart of SweetWater’s new spring seasonal. This year we’ve actually had quite a bit of it available on spot. Although it’s been selling out really fast. I think we’ll have another batch of it here, probably this month. Just some processing runs. And then after that we’re gearing up for a pretty big roll out in ‘17. We’re going to have a lot more volume available. We’re finding that product to be very popular, and that seems to be actually a trend in the market. What we’re seeing for sure, too, is more concentrated hop products. A little less volume in the kettle. Perhaps a little bit more yield at the end of the day for the brewer too. So yeah, I don’t know. It’ll be interesting to see how much of it is available. How much of it’s maybe a little bit of hype too. It’s probably a little bit of both. Frankly, there’s absolutely practical reasons to use it. I don’t expect it to take over the industry, but it’s something fun. A little different. It’s innovative. 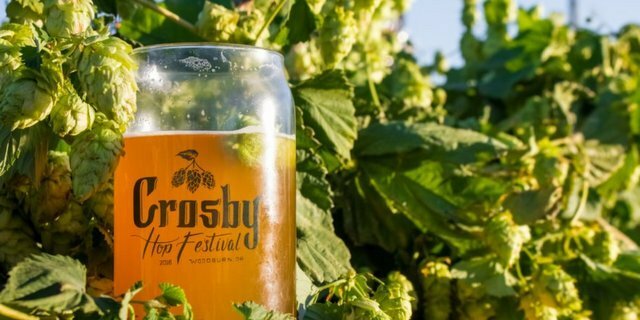 Tours of the Crosby Hop Farm last fall. The perfect subject for your next oil painting. What’s the process of extracting it then? It kind of varies. Right now, we’re actually working on a process to do it more deliberately. Because for us it started out a bit haphazard working with SweetWater — where we weren’t really looking to specifically start a product line. The guys at SweetWater are just really cool to work with, and it was cool to co-market together. What that of course did, which we weren’t really thinking through very well frankly, was it created a lot of visibility for it. I don’t think we really understood the extent which they were going to push [hop hash beers]. And it’s been quite successful for them. In turn, it’s turned out to be successful for us, but we were caught a little flatfooted. So, right now we are working on the R&D side to operationally figure out and get ways to make it more efficient. Because it’s been a bit inefficient the way we’ve been making it, so part of that will be why we’ll have more for 2017. Very cool. Something also cool: You guys are nearly 100 percent using renewable energy at this point? We are now. I was pretty excited to just roll that out the last few months. Put in our solar array that’s running about 30 percent of the farming operation now. We’re planning to expand that over the next few years too. In the meantime though, we wanted to commit to 100 percent renewables. We knew we weren’t able to do all of that in one year, just due to the cost. So, we went with PGE, which is our local utility, and they have a pretty awesome clean energy program. Nice, but let’s get down to some serious questions. How’s the band doing? Ha, yeah. They are doing well. I love that Link Wray, Bill Doggett-kind of instrumental rock and roll. Nice. Not many people know Link Wray. We play a lot of that — The Astronauts, The Ventures. We all have a blast. It’s funny though because we’ve been playing together long enough now that we cannot play for like six months and then just sit down, and it’s pretty tight still. It’s awesome. Are you heading to SweetWater’s 420 music fest [this past week]? I would love to. I’m missing it this year. I was there last year. Zak who works for us is heading down. He’s going to be giving a little talk in the experience tent. I think a talk about hash. We’ll be down there — or at least some of us will [not this editor, blah]. Oh right on. You’ll have to hook up with Zak. Totally. Now, you guys have a new website too? We just launched that last week. Okay. Is there anything new and cool from the brewers point of view? Is it just a research vessel? Or is there an opportunity buy direct online? So we added a little more functionality. Ease of use is part of it. Updated look and feel of course. From the customer perspective right now, we have a more robust catalog that’s available. We have our current spot offerings and prices on there. So, we are being increasingly transparent with that. In our industry, that kind of stuff is usually behind the veil. Yeah, call us first. But now in the world of online exchanges and online trading, it’s just where we’re going, and we said, you know what, we’re just going to embrace it. We’re also pushing hard, probably by June or July, but we’ll be rolling out online sales — so B-to-B-type sales — where commercial brewers will hopefully have a fairly seamless and automated experience. You’ll be able to buy a spot of hops right off the website. Ultimately, the vision of the site is to take a deeper direction where they can have a lot of resources in terms of customer products and research. Learn the business of hops: Craft professionals share their advice from farming to contracting. Pretty cool. What else? Anything else Crosby is doing that you want to mention. We’ve mentioned quite a bit. There’s so much going on. I guess something new and different we’re going to plan on doing, I guess I can put this out there, it’s not necessarily a secret or anything, but we’re going to be putting more of an emphasis in the coming years on building our fresh hop business, and we’re going to be working closely with USDA’s green program to put in kind of small plot experimental lines that they’re working on. Largely with the intent to observe as well as get into the market with fun, one-hop stuff that we can then cycle through quite regularly. It might be we plant an acre, maybe it’s a couple years, maybe we don’t like it. Maybe the brewers don’t like it. We take it out. A lot of that volume might be sold as fresh hops. Small volume stuff. Keith Gribbins drinks beer and talks hops with Brian Crosby, global sales account manager for Crosby, at the Crosby Hop Festival last fall. We just see a wealth of knowledge and opportunity with this pilot program to be able to help. It’s good for everybody too. So, it’s definitely not a headline, but it’s just something we’re working on. I don’t know. Might make a cool headline. Anyway, thanks for your time, Blake. I know you’re a busy dude, and the show’s just started. We’ll have to see if we’re going to be out at the harvest again this year. Maybe we’ll come visit you guys.